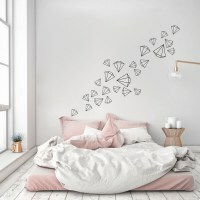 Set of 32 triangles wall decal to transform your blank wall into a feature wall. Set of 34 pine trees wall stickers to transform your blank wall into a feature wall. Set of 16 mini teepees, for a modern and edgy nursery! Set of 40 stars wall stickers in different dimensions. 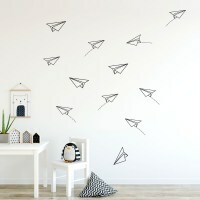 Set of 40 mini triangles wall decals to decorate your blank walls. 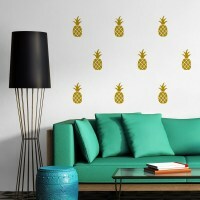 Set of 14 funky pineapples wall stickers to jazz up your walls! The pineapples are individual elements and you can arrange them as you like on your wall. 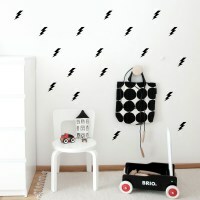 Set of 18 lightning bolts for your boy's room! Bring some fun into your nursery or kids bedroom with this set of pastel popsicles! Set of 18 pieces honeycomb wall decal to transform your blank wall into a feature wall. 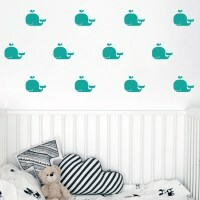 Set of 30 hearts wall decal to transform your blank wall into a feature wall.